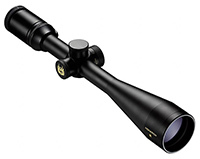 Nikon’s MONARCH 3 Riflescope with BDC Distance Lock function has an optical system located in the first focal plane, which allows the riflescope to maintain its scale and distance proportion on a target throughout the entire zoom range. The greatest benefit of these new BDC Distance Lock-equipped riflescopes will be for those who use Nikon’s Spot On™ Ballistic Program and BDC reticles to compensate for bullet drop at extended ranges. To simplify field adjustments, the riflescope features Spring-Loaded Instant Zero-Reset turrets. It also has a comfortable eye relief, smooth zoom control and is Nitrogen purged and O-Ring sealed for complete waterproof, fogproof and shockproof performance. The MONARCH 3, like all of Nikon’s riflescopes, is optimized for use with Nikon Spot On™ Ballistic Match Technology. The Spot On program provides users with exact aiming points on the BDC reticle for any load or ammunition at a specified range. Spot On is free online at NikonSportOptics.com/SpotOn and is now free for mobile devices, including the iPhone®, iPad® and Android™ platforms.